While Gogo Inc. is currently sitting quite pretty with about 80% of all wired commercial aircraft in the United States using its cellular network-based technology to keep passengers on the Internet while in flight. But there’s a new kid on the block ready to shake things up, in the form of an AT&T and Honeywell joint effort. The two companies announced that they’re teaming up to provide high-speed, in-flight Internet in the United State, reports Reuters, which will set them up to compete with Gogo. 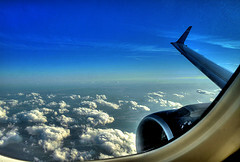 The new service is expected by late 2015 and will usean AT&T 4G LTE network and Honeywell systems and hardware to provide broadband services to a slew of inflight ventures as well as airlines that might want to boost the connectivity onboard planes for things like checking the status of various parts or getting weather reports. Gogo sounds like it’s not worried at all, even though shares fell after the announcement by AT&T and Honeywell. Honeywell says the AT&T system would be faster and have greater bandwidth than existing systems, without forking over any specific numbers for approximate speeds of the 4G network. There’s quite a varied playing field out there already in terms of speed — Gogo is working on a satellite-based system that can provide speeds of up to 70 megabits per second, much faster than its current service of 9.8 mbps for the current air-to-ground service. This new option as well as a slew of others launching recently or soon make it tough for airlines to choose which to use, as it’s expensive to outfit an entire fleet with a system.